November 2015 has seen the installation of our long anticipated all new computer controlled creasing machine. 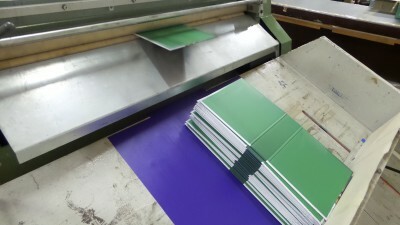 Creasing of paper over board binders can now be done at least 4 times faster than previous and with the investment of our new creasing machine, also enables us to offer ‘multi creasing’. Multi creasing is an attractive, functional, yet simple variation on the traditional ‘double crease’ format for standard paper over board ring binders and folders. KSP introduced Paper Over Board production in house back in 2005 and what a decade we’ve had!! A client list that includes John Lewis, Nandos, The Bank Of England, Marks & Spencer’s and Next to name just a few, it’s proved to be a very successful decision. From small volumes and straight forward beginnings, we can now take on both short and large projects for some very prestigious clients. KSP have built an enviable reputation over the last 10 years in this market place as a quality, reliable supplier of Paper Over Board binders and similar products to clients all over the UK and Ireland.